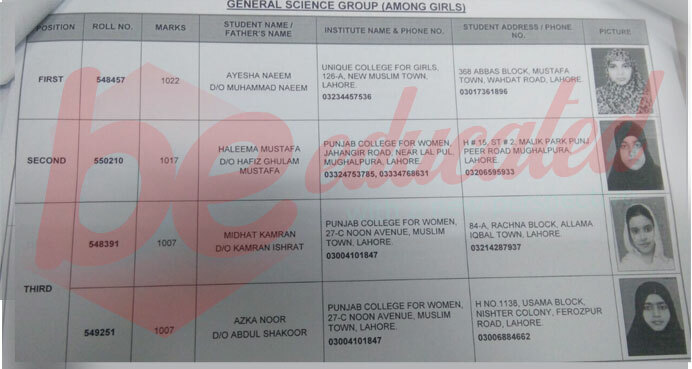 Lahore Board 12th Class Result 2019 will announce on 12 September 2019 according to 12th Class Lahore Board Officials. Board of Intermediate and Secondary Education Lahore, is going to announce the result on September 12, 2019 as according the official announcement. The result of Inter part-II Lahore Board will declare the result along with other all Punjab boards’ results, 2019. All the awaiting inter part-II students will be able to check their result online on Pakistan’s fastest website BeEducated for students. So till them we recommend all the students to stay in touch with BeEducated site to get latest updates about the inter part-II result 2019. Till then we wish you best of luck for your result. Board of Intermediate and Secondary Education, Lahore (BISE Lahore) is an authoritative body for inter and matric level education in Lahore Division. The board is performing its duties as an educational body since 1954. Before its establishment, matric and inter exams were conducted under the provision of University of the Punjab. The jurisdiction of Lahore Board has been confined to many districts including Lahore, Sheikhupura, Okara, Nankana Sahib and Kasur. This board is also considered as the main stream of education in the country. Every year more than two million candidates appeared in under this board. This year Lahore board conducts inter part 2 exams in the month of May, now after the interval of four to five months, board is announcing the result on September 12, 2019. For which BeEducated will also upload the result here on this website soon after its official announcement as it will appear on the Lahore Board official site too. Student must stay in touch with us to latest updates regarding the result of 12th class 2019.